Bad Company | Arts and Culture | Style Weekly - Richmond, VA local news, arts, and events. Meth is a hell of a drug. 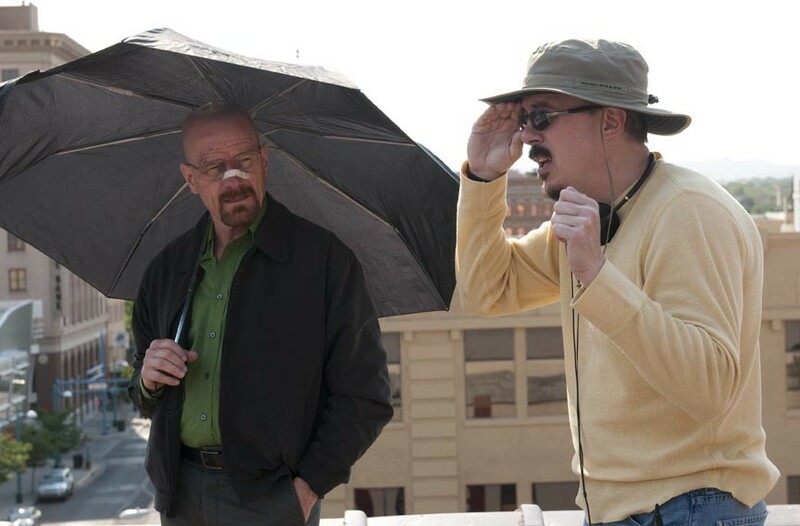 Bryan Cranston, who plays unlikely criminal Walter White, on set with "Breaking Bad" creator Vince Gilligan. Will Jesse Pinkman and Walter White finally turn on each other to decide who's the best meth cook in the West? Will Hank finally track down his Heisenberg, only to realize it's his brother-in-law? Will Walter's windshield remain unbroken for once? The answers to these questions are what fans of AMC's "Breaking Bad" hope to have resolved this summer as the show enters its fifth and final season. But for the big answers, audiences may have to wait longer. In an unprecedented move, the season will be broken into two parts, with the first eight episodes airing this summer and the last eight in summer 2013. While the change might irritate some viewers who want to see how this methamphetamine-fueled soap opera ends, for hometown hero Vince Gilligan, it's giving him the time he needs to do things right. "AMC has been really nice to me to allow me this kind of unusual schedule," the show creator says by phone from his office in Burbank, Calif. "If we screw up the end of this, we only have ourselves to blame, my writers and I." Gilligan grew up in Farmville and Chesterfield County and attended L.C. Bird High School. After winning the Virginia Governor's Screenwriting Award for his play "Home Fries," Gilligan moved to Los Angeles, writing scripts for "The X-Files." He eventually became an executive producer for the show and co-wrote the screenplay for the Will Smith superhero movie "Hancock." Now he's in the home stretch of his own creation, which he's described as turning Mr. Chips into Scarface. After high-school teacher Walter White (Bryan Cranston) finds out he has terminal lung cancer, he turns to cooking meth to provide for his family after he dies. In the process, mild-mannered Walt becomes a ferocious and intimidating character, harming innocent people and becoming less and less of a protagonist. Keeping audiences entertained while watching Walt's slow descent into evil is no small task. With rabid fans analyzing every character's move, Gilligan says he feels the pressure to keep his show from jumping the shark. "There's this constant feeling that you don't want to let anyone down," Gilligan says, adding that he doesn't want the show to last longer than it needs to. "I always said from the start, this is a show about transforming the main character from a good guy to a bad guy, and there's only so bad this guy can get." Still, Gilligan is keeping mum about the details of the new fifth season, politely leaving questions about a Walt vs. Jesse (Aaron Paul) showdown, or rumors of Walt's death, open. "I kind of have to be coy when answering these questions, because I certainly don't want to ruin anything for anybody. The best way I can comment is that I love how much the fans of the show pay attention to its ins and outs." The first eight episodes have been filmed. Two are in the can, and the others are in various states of editing. While crew members might get a break, Gilligan will be working straight until this time next year to make sure everything stays on course. "I hate to admit it, but I'm a bit of a control freak," he says, joking. "You want things to end with a bang." Things certainly did for Walt's biggest adversary yet, fast-food restaurant owner and meth distributor Gus Fring, played by Giancarlo Esposito. (Spoiler alert.) Using a homemade bomb and an elderly man in a nursing home, Walt blew Gus apart in the season-four finale. New episodes of "Breaking Bad" air Sundays at 10 p.m. on AMC.